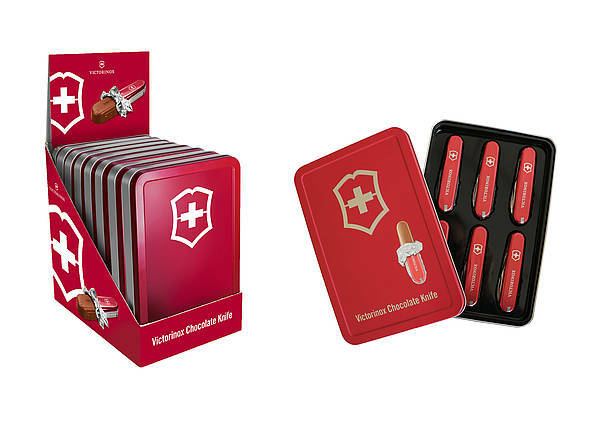 Our Victorinox Chocolate Knife, a finest premium Swiss milk chocolate filled with a tender melting hazelnut-gianduja, is a delicious indulgence. All above, it imitates the look and the functionality of the original Swiss Army Knife. 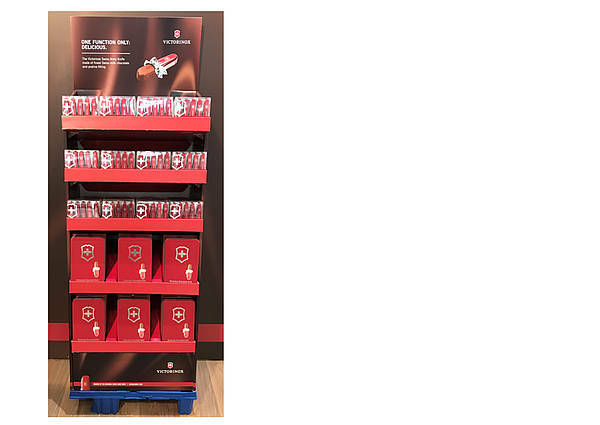 Gysi AG Chocolatier Suisse is the only authorized manufacturer of the Victorinox Chocolate Knife – we own a worldwide license for the writing and the logo on the chocolate as well as on every kind of packaging material. 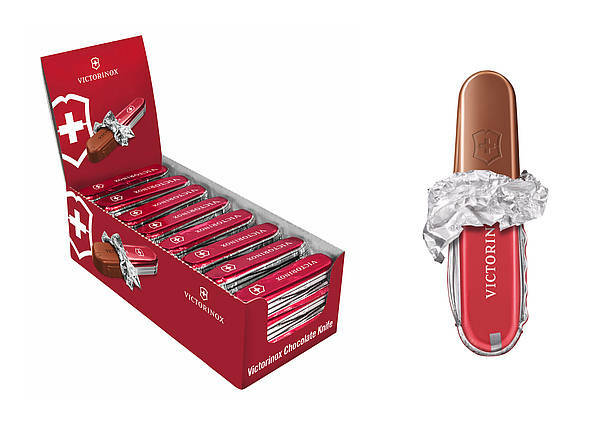 Unique in taste the Victorinox Chocolate Knife is the perfect treat for oneself, a high point of a lunch and dinner invitation or memorable souvenir. Sold in a display with 32 single pieces. Single chocolate knife packed like the Original Swiss Army Knife in a small cardboard box - a must have for every check-out area and the perfect surprise in all kind of hampers. Also personalized available with e.g. an imprint of one's company's name. Sold in SRP's with 30 or in brown outer cases with 100 single pieces. Sold in a shelf ready display with 20 or 12 boxes incl. 5 single pieces each. Sold in a shelf ready display with 8 boxes incl. 6 single pieces each. The Swiss chocolate classic in a beautiful cardboard box with festive design. A precious gift to treat the nearest and dearest with premium Swiss chocolate during the festive season. 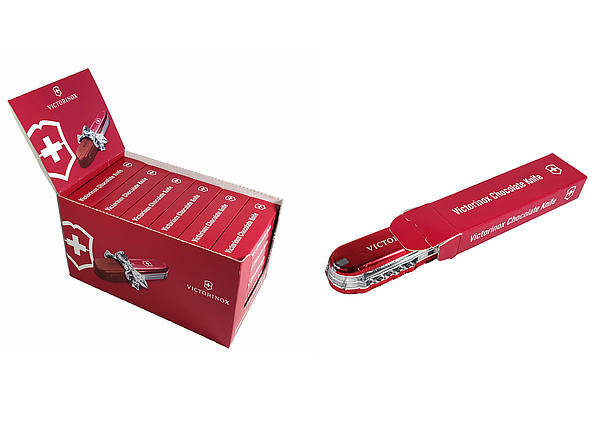 Presents the Victorinox Chocolate Knife perfectly and guarantees the product due attention- differently equippable.